Not the biggest doe in the world but finally broke the ice this year. Its been a tough season with lots of personal issues getting in the way of my time in the woods. The time I have spent has been productive with lots of activity and a few nice bucks spotted, yet nothing I had the opportunity to loose an arrow on. This afternoon I had deer all over me but a swirling wind proved to make things difficult. I was sitting on a pinch point on the edge of a new clear cut. Due to the swirling wind I managed to get caught by two different does, and one blew just as I caught a glimpse of what looked to be a pretty decent buck in some dense cover about 40 yards away. After some frustrating moments, this doe gave me an opportunity right at dark. 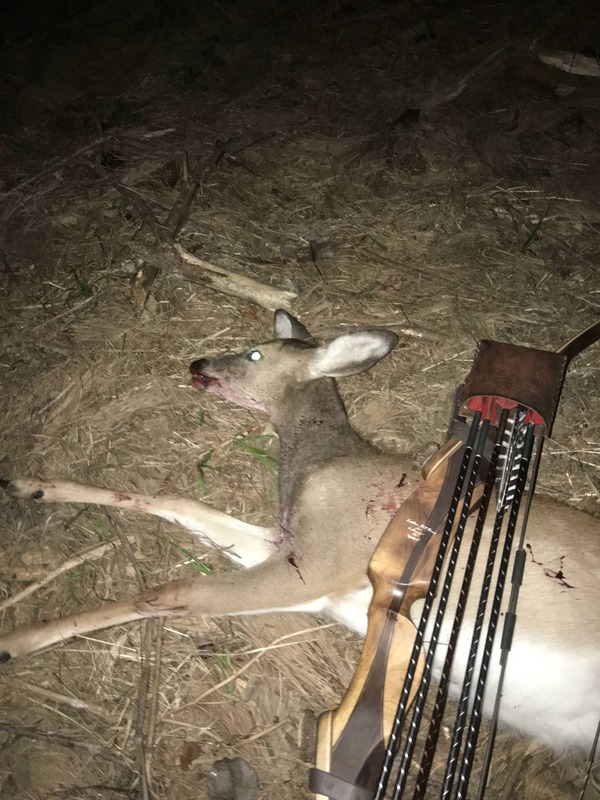 I shot her at 30 yards in between two trees. I was thinking she was one of the larger does that had blown previously but am happy to finally bloody my newest tall tines none the less. I am leaving Wednesday for a work trick but hoping to get back next week and get on one of the mature bucks I have on camera while they are still chasing! They all look the same on the table, food for the family. now you can relax and get the "big One "